For all of the undeniable conveniences the Internet has brought us, it's becoming an increasingly dangerous place to be. Both individual hackers and entire government agencies are now able to hack into your computer or smartphone from across the globe and steal everything from your browsing history to your credit card numbers, and they're often able to do so without your knowledge. A Virtual Private Network (VPN) is the first and most important line of defense against these nefarious cyber attacks, and you should never surf the Web without one—regardless of whether you're using a public or private connection. 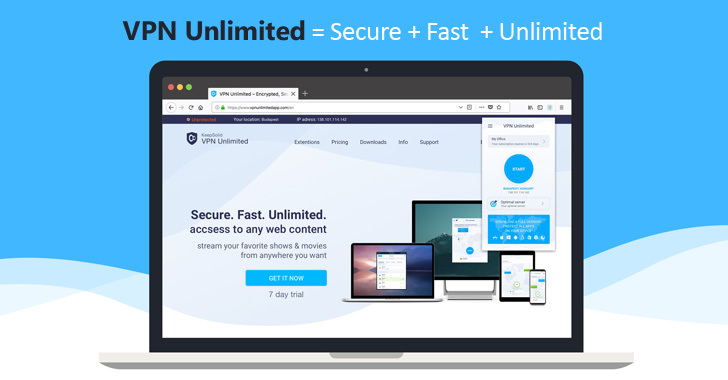 VPN Unlimited is an award-winning service that provides unparalleled and unlimited browsing security across up to 5 devices simultaneously (iOS, Android, Linux, Mac OS X and Windows), and right now a lifetime subscription is available for 88% off at just $59.99. You'll also be able to protect your entire family's online activity without restriction and use a variety of browsing tools such as Trusted Networks, Ping Test, and Favorite Servers to ensure that you're making the most of your connection at all times.